As far as quick cooking goes, it is tough to beat stir-frying. Heat your wok or wok-style pan as hot as you can get it, add some peanut oil (or some other oil with a high smoke point) throw in some meat (if you want) and veggies, cook until everything is slightly soft, add your sauce and stir until it thickens and that's it. Usually this takes about 10 minutes from start of cooking to finish, give or take a few minutes depending on what it is exactly that you are stir-frying (meats and soft vegetables go quickly, hard veggies like broccoli take a bit longer). There are many benefits to stir-fry cooking. Stir frying is an excellent way to work a variety of vegetables into a meal (and to use up any extra veggies you may have hanging around), and more vegetables is never a bad thing. While the word fry conjures thoughts of fat-laden, greasy fare, stir fried food is anything but fatty and greasy. Aside from the fact that the amount of oil used is minimal (usually just a few teaspoons or tablespoons for the entire meal), peanut oil is high in monounsaturated fats which have been shown to lower blood LDL (the "bad" cholesterol) while increasing blood HDL (the "good" cholesterol). Serve over a whole grain rice and help that heart even more. Lastly, stir frying is a fast and easy dinner that can be made even more convenient with some advance preparation. 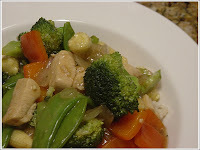 To keep your stir-frying healthy you definitely want to avoid most of the prefabricated stir-fry sauces available in the grocery store, as they are usually loaded with tons of sodium and other undesirables. Stir-fry sauce is quick and easy to make at home (and has a much cleaner flavor). Most sauces are a combination of soy sauce, garlic, vinegar, sugar, and salt with other options like ginger and various spicy elements often playing a role. You can use pretty much whatever meats, vegetables, or combinations of both that you like. Generally, you want to cook the meats first to sear the outside, then add the vegetables (harder vegetables go in before softer vegetables). Sometimes you may want to remove the partly cooked meat from the pan before adding the veggies and then adding it back in before the sauce so as not to overcook the meat. Play around with different combinations and sauce ingredients until you find something that you really love. If you know you're making this stir-fry during the week, you can chop the vegetables ahead of time (except for the onion), that way when you're ready to cook all you'll have to do is chop the onion and make the sauce. You can go start to finish in under 30 minutes (take that Rachael Ray), just don't forget to start the rice! Mise en place is essential with stir-fry as the cooking goes extremely fast and you won't have time to chop or make the sauce once you start cooking. Begin by chopping everything into bite size pieces and making the sauce. Heat your pan over high heat and add the peanut oil. Add the onion and a pinch of salt, fry for about 1 minute then add the chicken. Once the chicken is no longer pink on the outside (about 2 minutes), add the broccoli. After about 3 minutes, toss in the rest of the veggies. When all the veggies are slightly softened (they should be tender, but NOT mushy), add the sauce. Stir constantly until the sauce thickens and nicely coats all the vegetables and the chicken. This will take 2 to 3 minutes. Put some rice in a bowl, top with some of your chicken and veggies and serve. I love stir fry. There are so many ways to change it up and have a different meal every time. Thanks for all the photos.